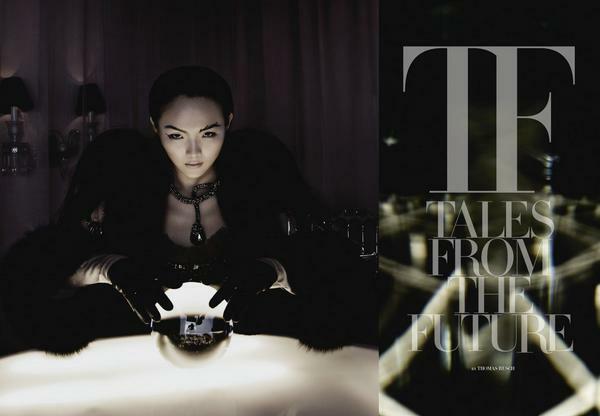 Ein Tan is on one of the premier covers of this new alternative bridal/wedding magazine called Bond, Issue Zero. Glad to see her still booking jobs in the US. 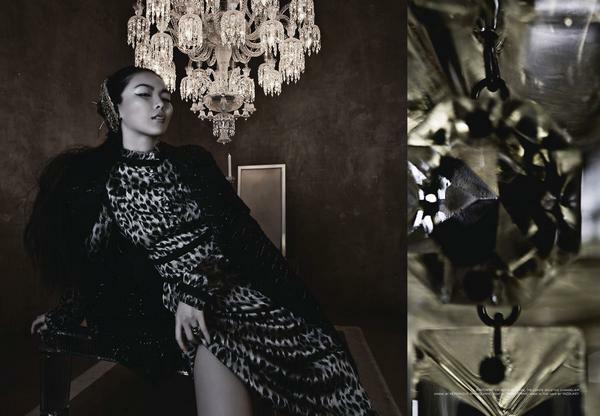 There are some amazing editorials inside the magazine including one with an Asian model. But I'm not sure if it is Ein Tan in the editorial or someone else. Will do some research and post the photos here. I found this interesting photo of Ling Tan, photographed by Uli Weber. Does anyone know where this is from? 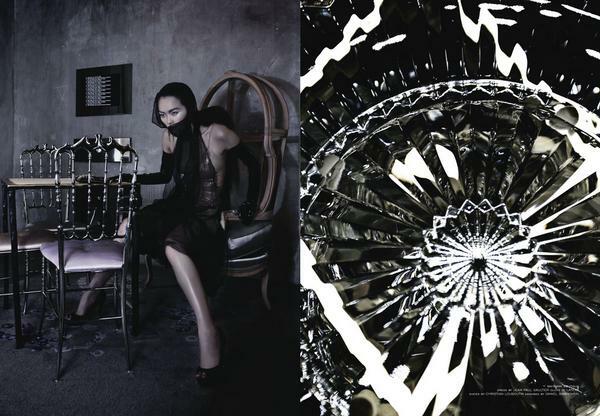 Here is one of Han Jin's earlier work for V Magazine, #46. She appeared on the first page of the editorial and again, in a lot of makeup. But this time, the makeup was actually flattering and beautiful and Han Jin looks fabulous here. 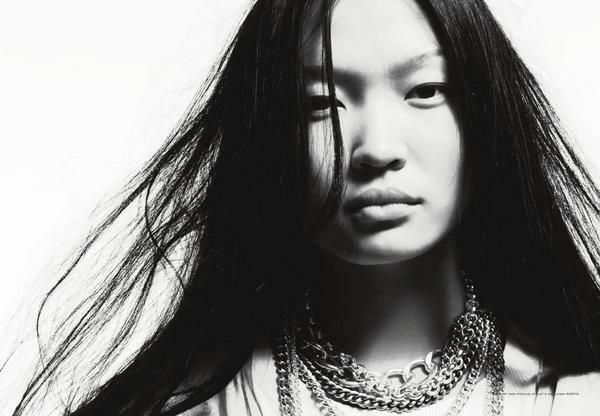 Lakshmi Menon is supposedly coming back for another season in the ad campaign (Spring/Summer 2009) for Givenchy, making this her second consecutive appearance at the label. She is also rumored to be in the next ad campaign for Max Mara and H&M. In addition, there is an editorial for US Vogue in the works. After the success on the runways of New York, Paris and Milan, Spring/Summer 2009 looks to be a stellar year for her. This editorial for the Neiman Marcus Christmas 2008 catalog is already out. It was quoted by NY Times as "an annual exercise in excessiveness that includes a $10 million thoroughbred racing stable in Kentucky alongside a $1,995 Prada lace bag." This catalog has some of the most expensive and luxurious things in the world. It seems like Korea Vogue is the only magazine that understands Han Jin's look and managed to bring out the best in her. Some of the other magazines' styling and make-up on her were simply atrocious. 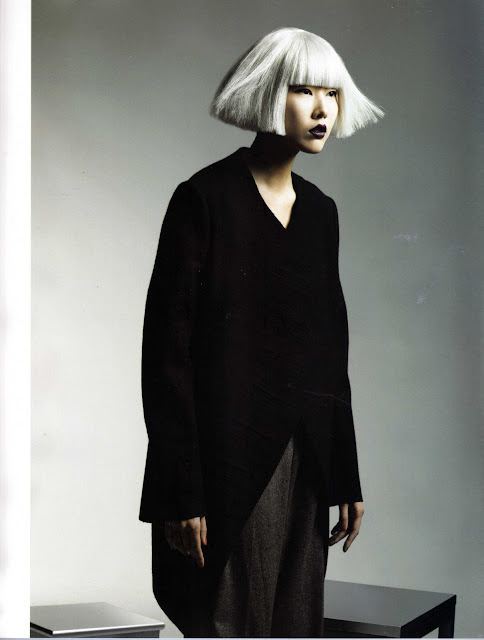 Han Jin best editorial work, in my humble opinion, appeared in the July 2008 issue of Korea Vogue called, L.A. Confidential shot by Hyung Won Ryoo. 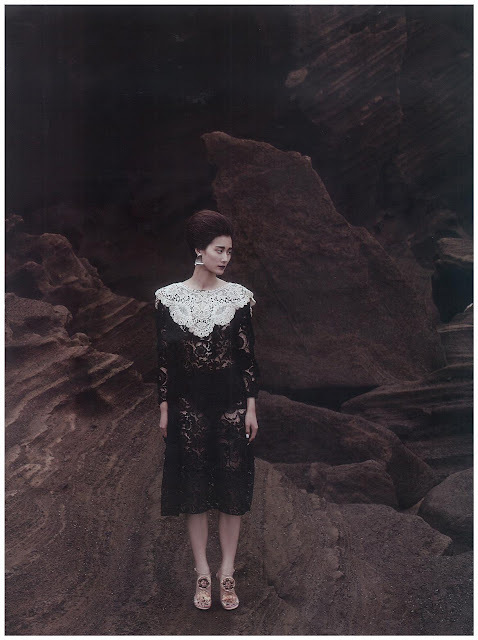 The photos were beautiful and Han Jin looked totally high fashion and pretty at the same time. That said, I love Photo #1, #3 and #9 in this set. 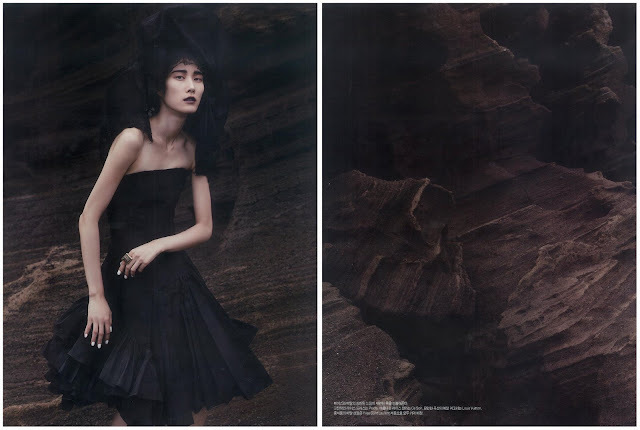 This dark and interesting editorial from Korea Vogue, August 2008 has an eerie feel to it, perfect for the upcoming Halloween holiday. It also looks like an Icelandic widow mourning for her late husband whose boat went missing after a dark storm -- so apropo for the economic crisis in Iceland now. Korea Vogue should have saved this for their October 2008 issue, in my opinion. Hye Park, one of the top Asian models working today, has another cover (with Korean pop singer, Rain) on Korea Harper's Bazaar's November 2008 issue. She has been on so many Korean magazine covers that I have lost count already. Her non-Korean magazine covers include (Italian) Flair and (French) Revue de Modes. On the ad campaign front, this has been a stellar year for Hye. She booked an international ad campaign for Cesare Paciotti last season and right now, she can be see in two major ones with Max Mara and Tiffany. Her Max Mara ads have been on heavy rotation in every major fashion magazine around the world so she is definitely getting a lot of face time this season. Although her runway appearances have slowed down recently, she still manages to walk for most of the top designers, including Louis Vuitton and Oscar de la Renta. And Hye Park doesn't come cheap either. Not every designer can afford to pay her to walk on their shows. Her agencies in NY, Paris and Milan have probably hiked her show rates to such exorbitant heights that she could walk on some selected shows only. Selina Khan, who competed in the 2007 Elite Model Look competition, burst onto the scene this season at the New York Fashion Week and managed to snag 8 shows, including Ralph Lauren and Lacoste. Represented by One Models in NYC, the young girl from the Caribbean (she represented The Antilles at the Elite Model Look competition) scored an editorial in Teen Vogue recently (November 2008) shot by fame photographer, Bruce Weber. 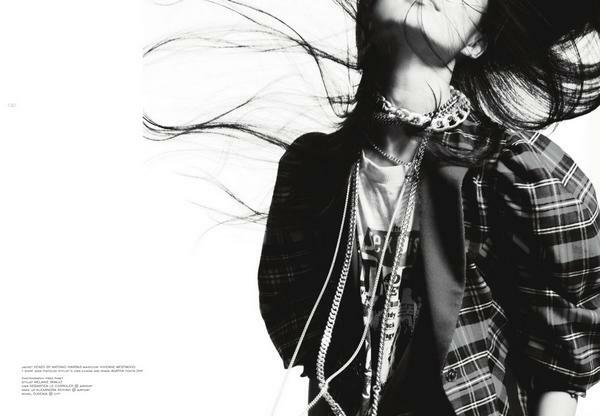 Although the editorial is not spectacular, it is a great start for a new model and a typical shoot for Teen Vogue. There isn't a whole lot of information about her on the internet but stay tuned. I expect to see more of her work in the near future. 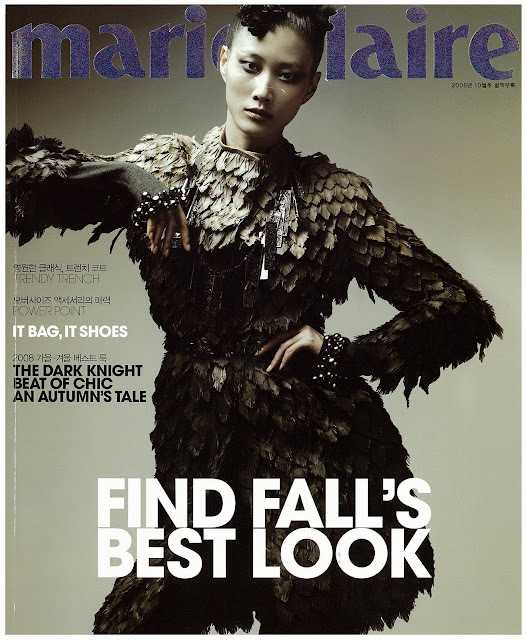 Here is Hyun Yi Lee in Burberry Prorsum's feather jacket from the Fall 2008/Winter 2009 collection on the (additional booklet) cover of Korea Marie Claire, October 2008. You can watch the video of the runway show here.